The game focuses on Prime Minister Sheikh Hasina has urged teachers and to create a pro-game settings each institution. 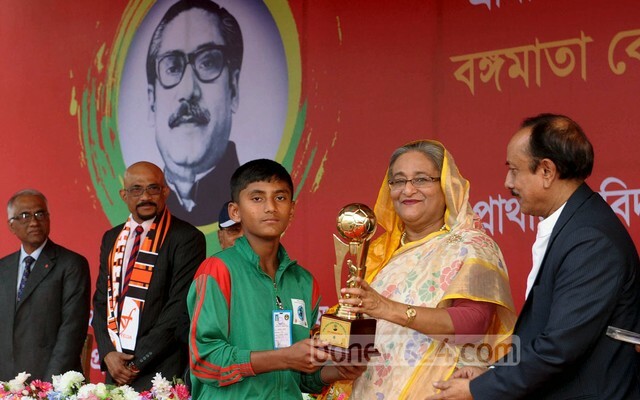 He did call on Tuesday to award Bangabandhu National Stadium Cup Primary School Football Festival. He also said that every student Upazila will have a mini stadium for practice to ensure your game. "Students, if they will not be on track at the sports and cultural activities," he said. At the ceremony, the Cox's Bazar Rajakali government primary school Bangabandhu Gold Cup Primary School Football Tournament 2015 trophy. Hasina also awarded enjoyed Bangamata Fazilatunnesa Mujib Gold Cup Primary School Football Tournament 2015 final from the VIP gallery, and the winner, Mymensingh Kalasindur government primary school football team. This year, 63,509 and 63,431 teams took part in the 'Bangabandhu Cup and Cup Bangamata respectively. Prime Minister, it was the team to many sections of the "more competitive." Ministry of Primary and Mass Education Cup has been held since 2011.